A dramatic stoppage time equaliser denied FC Halifax Town victory as they drew 1-1 with Leyton Orient at The Shay. 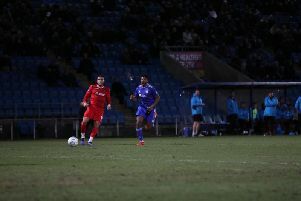 Dayle Southwell’s penalty, the first goal the visitors had conceded in five-and-a-half hours, looked to have inflicted Leyton Orient’s first defeat of the season, but substitute James Alabi scrambled in a late leveller - the sixth time they have scored in the last five minutes this term. Jamie Fullarton’s side were under-par in the opening half, but a rejuvenated Halifax roused themselves after the interval to earn a share of the spoils, although Orient would have felt hard done-by to come away with nothing. That’s Sutton, Wrexham and Leyton Orient all denied victory in the last eight days - fairly strong evidence to suggest Town could be here to stay among the National League’s big boys. Town have more often than not flown out of the blocks this season, especially at home, but that wasn’t the case here; Orient moved the ball with more flow and finesse, while Halifax looked subdued by their standards. Josh Koroma brought a couple of regulation saves out of Sam Johnson in a bright start from the visitors, who played like a team yet to lose this season. Orient were aggressive and snappy in the tackle - usually a Town trait under Jamie Fullarton - not giving the likes of Matty Kosylo or Jordan Preston the time or space to turn and run at them; their opposite numbers Jobi McAnuff and James Dayton saw much more of the ball. The pressure from the away side built as the first-half wore on, and should have resulted in Macauley Bonne putting them in-front when Dayton found him unmarked near the penalty spot after a quick break, but the striker blazed over. Orient were again close to scoring shortly before the interval when, after some neat, quick passing, Joe Widdowson’s cross was just out of Koroma’s reach in the middle. To be fair to The Shaymen, they remained solid at the back despite seeing far less of the ball, with Orient failing to turn their superiority into a glut of chances. But Town had been off-the-pace in comparison to their high standards at The Shay, which resulted in them coming into the game with a 100 per cent home record. The hosts had the chance to break on the verge of half-time, but Southwell chose to pass to Kosylo rather than find the run of Jonathan Edwards, and the opportunity was lost, which seemed to sum up their lack of a cutting edge. Orient spurned another big chance to take the lead when Bonne’s low cross found Koroma but he hit the outside of the post from the corner of the six-yard box. By the time Southwell blasted Town into the lead from the spot, after Kosylo had been fouled, Town had improved since the interval, competing better, offering more urgency and defending with real doggedness. But Orient will have wondered how they were trailing on the balance of play. The goal swung the momentum of the match further in Town’s favour though, with the hosts playing with much more purpose and confidence, while Kosylo and Preston became increasingly influential. Orient struggled to respond, as Town dug in, but Alabi preserved Orient’s unbeaten start with a low finish after some pinball in the Halifax box. There was still time for Kosylo to go close with a rasping free-kick before Nathan Clarke had a chance to win it against his old club with a header from the resulting corner. Halifax: Johnson, Hanson, Clarke, Brown, Skarz, Lenighan, Berrett, Preston (Odelusi 90), Southwell (Maher 84), Kosylo, Edwards. Subs not used: Rowley, King, Sellers. Leyton Orient: Brill, Widdowson, Coulson, McAnuff, Clay (Harrold 76), Bonne, Dayton (Alabi 82), Judd, Koroma, Ekipieta, Lee. Subs not used: Sargeant, Lawless, Happe.